You can find on this page the map of Paris airport transportation, the map of Paris Charles de Gaulle airport, the map of Paris Orly airport and the map of Paris Beauvais airport. Paris is served by 3 international airports totaling more than 90.6 million passengers per year, two airports Roissy Charles de Gaulle (CDG) and Paris Orly (ORY) operated by the company ADP and a lowcost airport Beauvais Tille (BVA) operated by the company SAGEB. The access to Paris airports: Paris Charles de Gaulle (CDG), Paris Orly (ORY), Paris Beauvais (BVA) is possible by bus or with the RER commuter train. 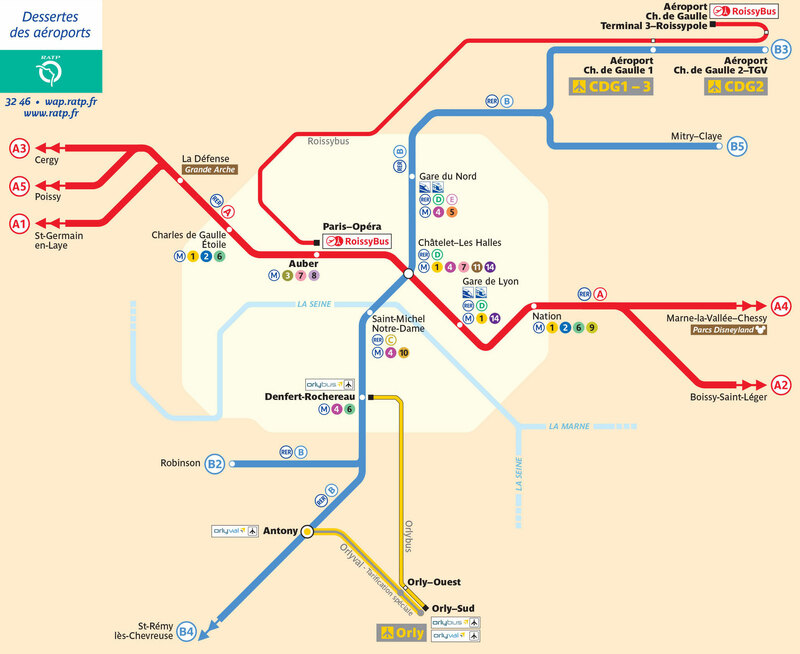 For CDG, you can use RoissyBus and the RER line B, for Orly you can take the OrlyBus or the OrlyVal then the RER line B. 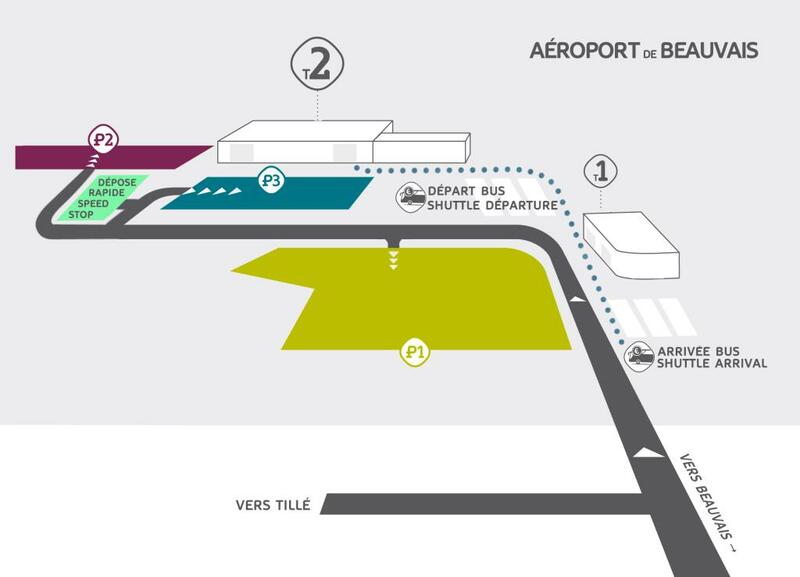 Finally for Beauvais, only a shuttle connects the airport to the Porte Maillot in Paris. The airport of Paris Charles de Gaulle also known as Roissy Charles de Gaulle or CDG is the main French airport located 14 miles (23 km) north east of Paris. It is the 2nd largest airport in Europe after the London airport Heathrow and the world's seventh largest airport for passenger traffic with 61.5 million travelers in 2012. It has 3 terminals, terminal 1, 3 and terminal 2 that is the main one and includes terminals 2A, 2B, 2C, 2D, 2E, 2F, 2G. Many transports are linking Paris Charles de Gaulle airport to the center of Paris. You can take to join the capital: the RER B, the special RoissyBus shuttle to Opera, the N140 and N143 Noctilien night bus to Gare de l'Est, the bus 350 to Gare de l'Est, the bus 351 to Nation, the Air France bus to Etoile, but also the VEA shuttle to Disneyland Paris. 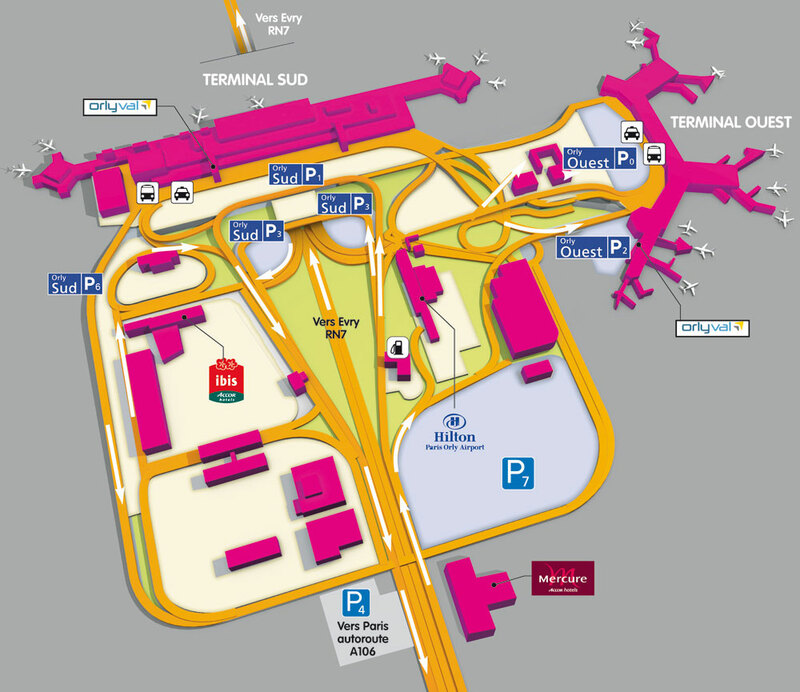 The airport of Paris Orly also called Orly is an important French airport located 9 miles (14 km) south of Paris. It is the 2nd largest airport in France after Paris Charles de Gaulle airport and the 11th European airport for passenger traffic, with 25.2 million travelers in 2010. It has 2 terminals, the South terminal and the West terminal. Many transports are linking the Paris Orly airport to the center of Paris. You can take to join the capital: the OrlyVal then the RER B, the special OrlyBus shuttle to Denfert Rochereau, the 183 bus to Porte de Choisy, the bus 91/10 to Massy Palaiseau TGV station, the tram 7 towards Villejuif, the Air France bus to Gare Montparnasse or Etoile but also the VEA shuttle to Disneyland Paris. The airport of Paris Beauvais also called Beauvais-Tillé is a French lowcost airport located about 43 miles (70 km) north of Paris. It is the 9th busiest airport in France and the 3rd Parisian airport for passenger traffic with 3.9 million travelers in 2013. It has 2 terminals, terminal 1 and terminal 2. Paris Beauvais Airport is connected to the capital by a single shuttle arriving at the Porte Maillot in Paris. As for Paris CDG and Paris Orly a VEA shuttle connects Paris Beauvais to Disneyland Paris.